Not always the most neutral tonally and lacking some detail at times, this mat is, however, perfect for lovers of energetic rhythm. 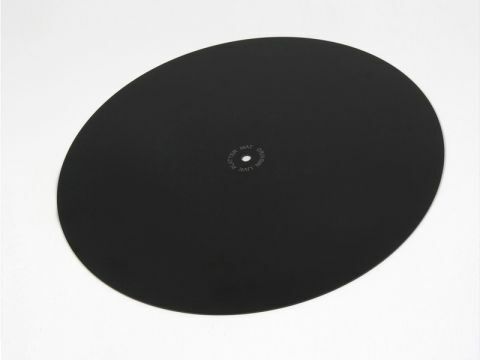 The Origin Live Platter Mat is about as simple as a turntable mat can be – a flat sheet of hard plastic, just 1.5mm-thick. The price is presumably explained by the fact that it's not any old plastic: Origin Live doesn't identify it and we don't recognise it as any of the usual engineering materials. The top surface is shiny, the bottom matt and it is quite non-resonant when struck. It is also slightly oversize, which we can't imagine ever being a problem on any decent turntable, but does make it slightly harder to lift off a record. Origin Live does not necessarily recommend it as a replacement for existing mats, pointing out that it can often sit on top of the old one, its minimal thickness being unlikely to cause problems with arm height adjustment. Accordingly, we tried this mat both on, and instead of, felt and rubber mats with metal or glass platter and on a plastic platter deck. In the latter case we could hear a difference but were inclined to be ambivalent about its direction, the results varying a little from one disc to the next, though the fundamental character of the sound was seldom much changed. However, with a metal platter the results were little short of profound. Most noticeably, the sound improved markedly in terms of rhythmic snap and dynamic attack, and this was, perhaps, most obvious with the Origin Live mat on top of felt. Rubber underneath was a little less lively and with the mat directly over metal the sound was a little too coloured for our tastes. Similar, though less marked, results were obtained with glass platters.